Question: "What does the Bible mean by 'dying to self'?" Answer: The concept of “dying to self” is found throughout the New Testament. 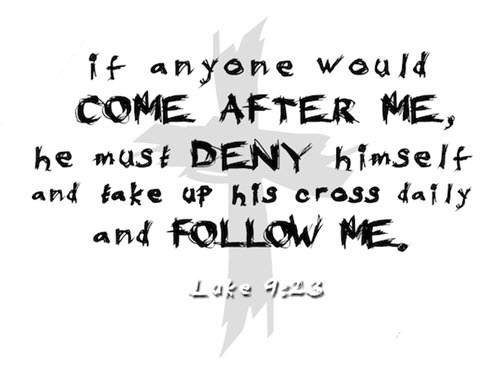 It expresses the true essence of the Christian life, in which we take up our cross and follow Christ. Dying to self is part of being born again; the old self dies and the new self comes to life (John 3:3–7). Not only are Christians born again when we come to salvation, but we also continue dying to self as part of the process of sanctification. As such, dying to self is both a one-time event and a lifelong process. Here the Saviour declares expressly what the indispensable requirement is for anyone who whishes to become a real disciple of His. He must relinquish all his possessions - not merely money and material things, but also his dear ones and everything that his heart clings to, yea, even his own life, his own desires, plans, ideals and interests. This does not mean he must sell all his possessions or give away all his money or desert his dear ones and become a hermit or beggar or wanderer, but it means that he must give Christ full control over his whole life with everything that hs is and all that he possesses, and that under His guidance and in His service he should deal with his possessions in a manner that is best. In some cases it has meant, or will mean, that a man will have to take leave of his worldly possessions and go into distant lands to work for Christ. In most cases, however, it means that man in his ordinary life places his all at Christ's disposal to such an extent that, while still remaining in possession of his goods, he honours and serves Him thereby. The important thing is that whosoever desires to follow Him must be inwardly free from worldly-mindedness, covetousness and selfishness and wholly devoted to Him. Norval Geldenhuys. Commentary on the Gospel of Luke. (Grand Rapids, MI: WM. B. Eerdmans Publishing Company, 1951), 398-399. A primary reason why we struggle to fulfill Christ's Great Commission is because we are guilty of a great omission. We fail to deny ourselves. Denying yourself is not the same as self-denial. Students, athletes and cult members practice self-denial, restricting themselves from substances and activities that keep them from reaching their goals. But the ultimate purpose of self-denial is self-glorification. The ultimate purpose of denying self is to glorify God. Jesus was talking about denying yourself in the essential battle of life. The scramble for the throne, the struggle over who is going to be God. Jesus doesn't enter into that battle - He's already won it. He occupies the throne and graciously offers to share it with us. But we want to be king in our lives by ourselves. Until we deny ourselves that which was never meant to be ours - the role of being God in our lives - we will never be at peace with God, or ourselves and we will never be free. You were not designed to function independently of God, nor was your soul designed to function as master. You will either serve God and His kingdom or Satan and his kingdom. Self-seeking, self-serving, self-justifying, self-glorifying, self-centered and self-confident living is in actuality living and serving the world, the flesh and the devil. On the other hand, denying yourself is not self-mortification. God is not trying to annihilate you, He is trying to restore you. When you deny yourself, you invite God to take the throne of your life, to occupy what is rightfully His, so that you may function as a person who is spiritually alive in Christ. Denying yourself is essential to spiritual freedom. Lord, too many times I have tried to live independently of You. I deny myself today and yield the throne of my life to You.